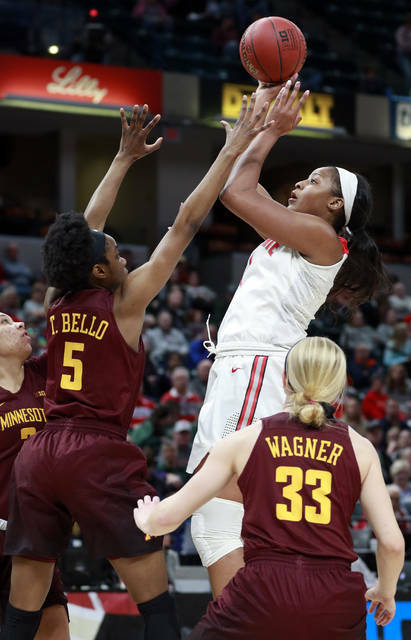 INDIANAPOLIS (AP) — Kelsey Mitchell scored 30 points, Stephanie Mavunga had 26 points, a Big Ten Conference Tournament record 21 rebounds and seven blocks, and No. 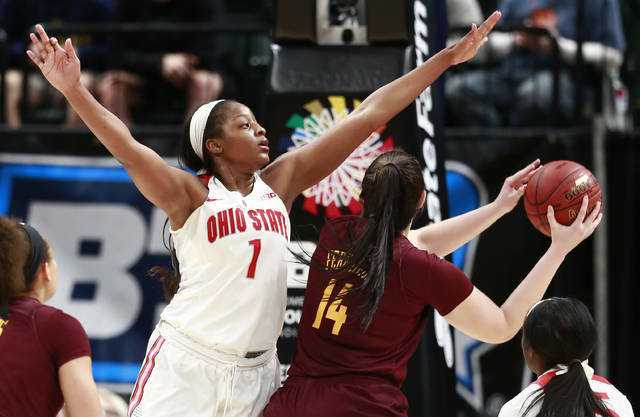 13 Ohio State used a late run to edge fourth-seeded Minnesota 90-88 in a semifinal game on Saturday, March 3. The top-seeded Buckeyes didn’t secure a spot in the championship game until Carlie Wagner’s 12-foot jumper from the right of the lane bounced off the rim as time expired. Ohio State (26-6) faces second-seeded Maryland, which beat the Buckeyes 99-69 in the only other meeting between the teams this season, for the title Sunday night, March 4. A basket by Kenisha Bell gave the Golden Gophers (23-8) an 85-79 lead with 4:40 to play. Linnae Harper quickly answered with a jumper for the Buckeyes. Mitchell followed with a 3-point play to make it a one-point game and Ohio State took the lead on the 16th lead change with a basket by Alexa Hart at 2:40. Eventually a Hart free throw made it 90-85 with 14.1 seconds left. Mavunga was dominant down the stretch. The Gophers missed seven straight shots and OSU had six blocks, four by Mavunga, in the last three minutes. She had back-to-back offensive rebounds to give OSU a 1½-minute possession into the final minute. 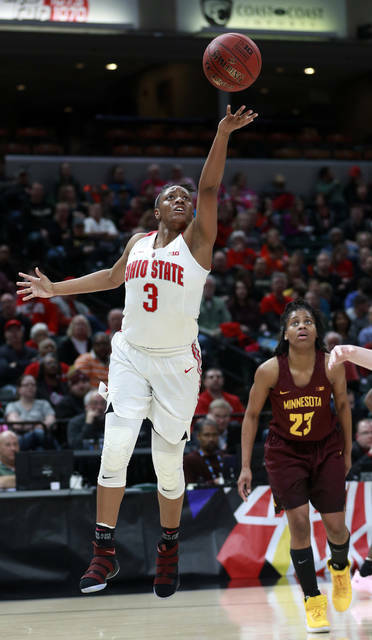 Gadiva Hubbard hit a 3-pointer with five seconds left, but after Ohio State’s Makayla Waterman missed two free throws, Wagner couldn’t tie it. Bell finished with 27 points, 10 assists and nine rebounds. Wagner had 26 points and Hubbard scored 20.